Ingredients: Apple, apple pomace, beet root, rosehip shells, green tea, hibiscus, sweet blackberry leaves, rhubarb, pomegranate pits, natural flavouring. On my brother's advice, I decided to try this iced, as he informed me that it is way better this way. And that I should make it pretty strong. So I have done both. I used two spoons in 20 oz of water and steeped for about 4 minutes. 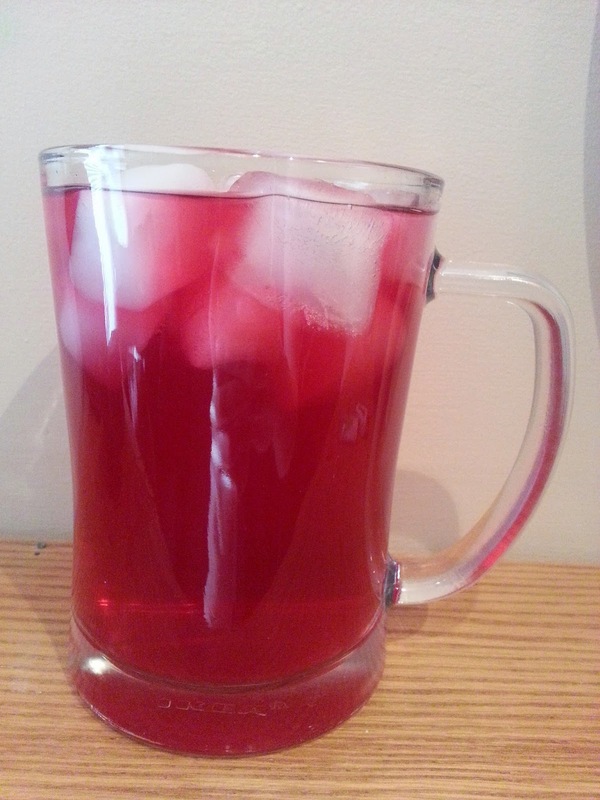 It has same incredible colour, and kind of looks like Koolaid. I am not sure what I was expecting to taste, but I was pretty confused on my first few gulps. I couldn't put my finger on what it was supposed to taste like... Then I got it. Bubblegum. No joke, it tastes like Chiclets! Those little colourful Halloween gums in packs of two that you chew for two minutes before all the flavour is gone? Yeah, this is the tea form of that amazing childhood flavour. Kids would go NUTS over this one! And you very well could, too! I think I would prefer it mixed with gingerale to make it a tea-pop, but it is still pretty interesting. I definitely recommend giving this a try, even if you just order one iced from a DavidsTea store. It is an incredibly interesting flavour.